Buy Direct and Save Big!!! both sound absorbing and block sound at one time. through a wall or cabinet and also helps to absorb echo and reverb inside a room or cabinet. Custom lengths can be requested. "SPC-5 Melamine Composite with Hypalon facing"
Melamine Composite with Hypalon facing"
"Melamine Composite with Hypalon facing" is a class one acoustic foam (fire retardant), with SoundBocker1™ combined into one product. "GK Melamine Mini Pattern Composite"
"GK Melamine Composites" is a class one acoustic foam, with SoundBlocker™ combined into one product. 24" x 48" sheets, 1-3/8" thick. "GK Polyurethane Composite with Tuftane facing"
SoundBlocker1 vinyl barrier combined into one product. "GK Polyurethane Composite with Aluminum Mylar Facing"
and a laminated foil covering. We can custom manufacture composites with specific requirements. acoustic foam on one side. help cut down on traveling structural noises. Works will in areas where space is an issue, and noise reduction and adsorption is needed. Great for treating floors! Apply under any sub-flooring or carpet padding and it will help block noise from transmitting through the floors. vinyl barrier can be custom ordered. 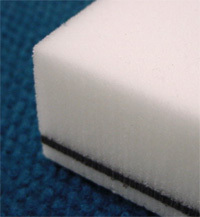 Is a combination of acoustic foam and loaded vinyl barrier. block sound from penetrating an area and also helps dampen reverb. Great for around generators, and load machinery. Used a great deal to line the Inside of sound isolation enclosures, and engine compartments, industrial partitions and so forth. acoustic foam with SoundBlocker1 vinyl barrier. convolution pattern to increase the acoustic absorption of noises. 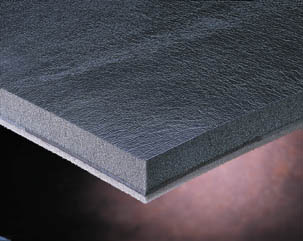 is a combination of a class one fire retardant Melamine acoustic foam and SoundBlocker1 vinyl barrier. 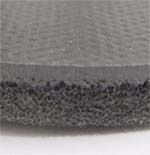 Both sides of this composite have a flat foam surface. the foam from oils, moisture, and dirt. It allows the surface to be cleanable. Works well in areas that are damp or oily. Also used to line the inside of sound isolation enclosures. and inside the cab of any loud machinery, and more. We also can apply a durable perforated vinyl surface to this material for a nicer look and feel for the cab interiors. 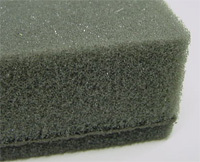 This composite combines polyurethane acoustic foam for sound adsorption and SoundBlocker1 vinyl barrier to help block sound all in one product. The aluminum Mylar surface reflects heat. 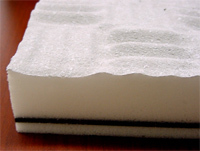 Additionally the foam will trap and dissipate mechanical noise generated by engine components. insulator for pipes and ducting. This is a high quality product that does the job right.